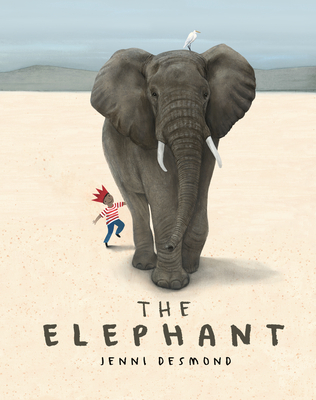 In this, Jenni Desmond's third nonfiction children's book about one of the large, endangered animals of Earth, we join a young boy as he learns about The Elephant. From Africa to Asia, the elephant makes its home. Light on their feet, despite their great weight, these magnificent creatures appear light and graceful because they're always walking on their tip-toes. They have excellent hearing and can detect the rumblings of other elephants from six miles away. And, just like humans being right handed or left handed, elephants can be right tusked or left tusked The recipient of the 2016 New York Times Best Illustrated award for her book The Polar Bear, Desmond creates illustrations that are scientifically accurate, strikingly detailed, and beautifully rendered in collage, paint, and colored pencil. A graduate of the renowned MA program in Children's Book Illustration at the Cambridge School of Art (ARU), Jenni works from her studio in London, UK. She uses collage, paint, and colored pencils to create her artwork, which she then scans and edits by computer. Jenni strives to make her illustrations entertaining, beautiful, and funny in equal measure. Her first picture book, Red Cat, Blue Cat, won the Cambridgeshire "Read it Again" Picture Book Award in 2013.